Heard of a Brand's Social Circle? Is an organization capable of creating its social circle, the type it wishes to? Being Social for an organization is a way to market itself, create a brand image, or just loosen up a little from the tightly bound cage of corporate culture and be free to express itself? Do the Social Circles really work? How far has healthcare adapted to the new trend of joining and creating the social circles? Indeed the questions above are food for thought, aren't they? OMG! 5 Questions in a row, too much to start with, or I should say too much to differentiate my article from the rest of the authors. Differentiate or die! Is what has been taught for long by the marketing gurus. But does differentiation really happen, especially in the models of healthcare. Is social media a medium to bring differentiation into what an organization does or does it become a medium to promote the organization in itself and its products/services. In actual situations, as per my experience and point of view I can say that a solvent strategy is adapted mixing both the ingredients and eventually the aim and objective behind the usage of social media makes the entire difference. Social Circle formation is a common marketing tool these days to enhance the brand visibility within the market. And of course it comes with a touch of West; needless to say, but yes we follow them. It helps differentiate one organization from the other and involves a different customer engagement possibility. In my current area of practice, while researching on facebook pages of healthcare organizations in India, I found out that mostly the content shared is targeted on increasing the wellness quotient of individuals. The Wellness quotient is mainly fed by sharing health tips, fitness mantras, diet regimes, healthy recipes, etc. And then the trailer of the socializing movie is released, various specialties within an organization are showcased, attention is drawn towards the heroes of the foundation and the great surgeries, treatments, inventions, discoveries and innovations that they brought into the medical and non-medical fraternity. And then the commercial part makes an entry, wherein the individuals are introduced to various products & services that he/she can avail for prevention and cure. In a way the movie as a whole, aims to create an aura of wellness while simultaneously meeting the bottom-line of an organization i.e. enhancement of customer engagement possibility. However, the next big level for Indian Healthcare industry will be sharing in greater detail about live surgeries & procedures, provision of virtual consultations and diagnostics, go paperless on reports prescriptions & feedback. A month ago, Houston's Memorial Hermann hospital was in news for tweeting a live brain surgery. It was reported that a social media team that includes a neurosurgeon from the neurosurgery team was sitting in an adjacent room answering questions on Twitter and posting photos and videos over YouTube, TwitPic, CoverItLive, and Pinterest throughout the procedure. In recent past, the hospital also tweeted an open heart surgery. Objective behind this was to explore educational possibilities amongst school and medical students. It also aimed at keeping the public informed what goes on when somebody in their family or neighborhood gets the same medical condition. Events like these are curtain raisers for social media connect in reference with dispersal of medical knowledge within the healthcare fraternity and beyond. The outcome majorly is the awareness and perceptiveness generated to facilitate the precise and erudite decisions while making a choice of treatment. Social media is the latest fad. Whether an individual is at home or work, he/she spends as much time as they can to stay connected within their social circles. Smart phones add to the flavour of this. It has made it much easier to have one’s presence in the virtual space 24 x7. On the other hand, the freshness of social media also comes with its own shortfalls. The social media is surrounded by the non-established practices and hence its mostly an adaptation of various trial and error methods, for determining what will work and what won't. And it is always uncomplicated to ignore the risks and go ahead. 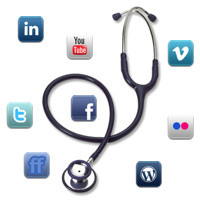 To tap the potential of social media in healthcare, the organizations are doing their level best to attract more followers, increase the reach and influence in consonance with being vigilant on privacy and protection policy. In present scenario, the number of Tech savvy healthcare professionals is very less. Additionally, to identify dedicated individuals in medical/surgical teams who can boast the accountability of texting to the world about the details of surgery instead of having a hands on experience on the surgery, remains a challenge. The road ahead is the road less traveled. Exploring newer opportunities and creating milestones while engaging customers should be the bottom-line of social connect initiatives. Adapting social media marketing as a business strategy can be a valuable tool to map business intelligence, levels of customer service, process improvement areas, as well as it can act as an opportunity for physicians and consultants to interact with physicians in various parts of the world resulting into provision of enhanced care and improved outcomes. In fields of drug trials, cases of rare diseases, distant care facilities, rural health programs, finding healthcare professionals for a right job, etc. social media can be the tool of maximized importance to share the information all across the world. Also, it helps a physician to practice a differentiation strategy. The more you are like the public the more you gel in. For a focused customer centric model it is necessary to provide an all- encompassing distinctive experience to the customer than what competitors have to offer. Social circles assist in destroying the barrier of hesitation amongst the doctor and the patient, and hence the overall engagement of customer becomes remarkable. However, it has to be kept in mind that Internet is a double-edged sword, issues may arise towards ingenuity of content or invasion of patients privacy and security. In worst case scenarios the scams, spams, fake accounts can destroy the public image of an organization/physician. Nonetheless to move forward, one has to take a step forward with the belief that future is bright. 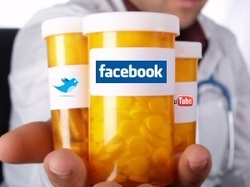 So it is thought and dreamt for the future of Social Media / Circles in Healthcare.